2003-11-20 Assigned to SEROCTIN RESEARCH & TECHNOLOGY, INC. reassignment SEROCTIN RESEARCH & TECHNOLOGY, INC. ASSIGNMENT OF ASSIGNORS INTEREST (SEE DOCUMENT FOR DETAILS). 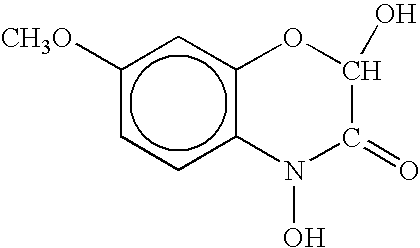 Assignors: FORSBERG, SCOTT R., ROSENFELD, MARK J.
Phenolic compounds with a phenolic molecule to which are covalently linked an oxygen-containing group, a nitrogen or another oxygen containing group, and a C1-C4 alkoxy group, obtainable from monocotyledonous plants, or by chemical synthesis, have been found to act as weight loss agents, appetite suppressants, mood enhancers and adjunctive therapy for arthritis, sleep apnea, fibromyalgia, diabetes and hyperglycemia. Additional chemical compounds of the present invention may include benzoxazinoids-cyclic hydroxyamic acids, lactams, and corresponding glucosides, which may serve as precursors to phenolic compounds. The phenolic compounds and precursors of phenolic compounds of the present invention, at concentrations suitable for human therapeutic use, may be obtained from monocotyledonous plants such as corn in their early growth states which are timely harvested for optimum yield. This application claims the benefit of U.S. patent application Ser. No. 09/834,592, filed Apr. 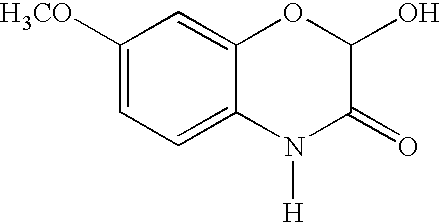 13, 2001, and entitled “NOVEL COMPOUNDS FOR USE AS ANTIDEPRESSANTS, APHRODISIACS AND ADJUNCTIVE THERAPIES IN HUMANS”, which claims the benefit of U.S. provisional patent application Serial No. 60/196,829, filed Apr. 13, 2000, and entitled “ANTIDEPRESSANT, APHRODISIAC, WEIGHT-LOSS AIDE, THERAPY FOR QUITTING NICOTINE OR ADDICTIVE DRUGS AND TREATMENT OF BETTERING REPRODUCTION IN HUMANS”, which are both incorporated herein by reference. Excessive weight (i.e., overweight) and obesity are part of the most rapidly growing public health concerns facing the world today. By the end of the 1980s, nearly one-fourth of Americans were overweight (a Body Mass Index (BMI) greater than 25, calculated as weight in kilograms/height in meters squared; Calle et al., “Body mass index and mortality in a prospective cohort of US adults”,  New England Journal of Medicine 341:1097-1105, 1999) or obese (excess body weight more than 20 percent above average for height, bone structure and age, or a BMI exceeding 30). The number of overweight children has nearly tripled over the previous 20 years; and, the prevalence and incidence of type 2 diabetes, a disease for which obesity is a major factor, in adolescents has significantly increased over the same time. By 1999, about thirty-six percent (36%) of the total population, or more than 97,000,000 adults, may be considered overweight. Currently, it has been estimated that about sixty percent (60%) of American are overweight and about thirty percent (30%) of Americans may be considered obese. Medications prescribed for losing weight often suppress appetite by way of mood enhancing attributes (Halpern et al., “Treatment of obesity. An update on anti-obesity medications”,  Obesity Reviews 4:25-42, 2003) and may include, beta-phenethylamine derivatives (fenfluramine, phentermine, phendimetrazine, diethylpropion, and sibutramine); tricyclic derivatives (mazindol); a naftilamine derivative (sertraline); phenylpropanolamine derivatives (ephedrine, phenylpropanolamine); and a phenylpropanolamine oxytrifluorphenyl derivative (fluoxetine). For rodents, the inhibitory effects of melatonin on growth and reproduction are blocked partially by 6-MBOA (Gower et al., “Reproductive responses of male  Microtus montanus to photoperiod, melatonin, and 6-MBOA”, Journal of Pineal Research, 8: 297-312, 1990). 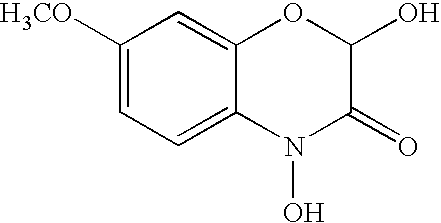 6-MBOA may obstruct melatonin at the melatonin receptors or act independently to check melatonin action (Sweat et al., “Uterotropic 6-methoxybenzoxazolinone is an adrenergic agonist and melatonin analog, Molecular and Cellular Endocrinology, 57:131-138, 1988). The high melatonin levels induced by 6-MBOA may cause desensitization of melatonin receptors (Daya et al., “Effect of 6-methoxy-2-benzoxazolinone on the activities of rat pineal N-acetyltransferase and hydroxyindole-O-methyltransferase and on melatonin production”,  Journal of Pineal Research, 8:57-66, 1990), but not for all rodents (Anderson et al., “Effects of melatonin and 6-methoxybenzoxazolinone on photoperiodic control of testis size in adult male golden hamsters”, Journal of Pineal Research, 5:351-65, 1988). This compound stimulates rather than inhibits melatonin biosynthesis and does not prevent stimulation of melatonin synthesis by norepinephrine (Yuwiler et al., “Effects of 6-methoxy-2-benzoxazolinone on the pineal melatonin generating system. J. Pharmacol. Exp. Ther. 233:45-50, 1985). 6-MBOA acts at both the alpha-(α-) and beta-(β-) adrenergic receptors (Daya et al., “Effect of 6-methoxy-2-benzoxazolinone on the activities of rat pineal N-acetyltransferase and hydroxyindole-O-methyltransferase and on melatonin production”, Journal of Pineal Research, 8:57-66, 1990), and stimulates adenylcyclase activity in the pineal, hypothalmus and pituitary glands (Sweat et al., “Uterotropic 6-methoxybenzoxazolinone is an adrenergic agonist and melatonin analog, Molecular and Cellular Endocrinology, 57:131-138, 1988). Certain responses to 6-MBOA, like uterine hypertrophy, can be duplicated with estrogen, but 6-MBOA is not an estrogenic compound (Gower, “Endocrine effects of the naturally occurring reproductive stimulant, 6-methoxybenzoxazolinone”, Ph.D. Thesis, University of Utah, Salt Lake City, Utah, 1990). Also, 6-MBOA increases the rate of synthesis of follicle stimulating hormone (Butterstein et al., “The plant metabolite 6-methoxybenzoxazolinone interacts with follicle-stimulating hormone to enhance ovarian growth”,  Biology of Reproduction, 39:465-71, 1988) and pituitary prolactin (Vaughan et al., “Hormonal consequences of subcutaneous 6-methoxy-2-benzoxazolinone pellets or injections in prepubertal male and female rats”, Journal of Reproduction and Fertility, 83:859-66, 1988). Hypothalamic luteinizing hormone-releasing hormone contents and pituitary gland weights are greater for at least one rodent species implanted with capsules containing 6-MBOA (Urbanski et al., “Influence of photoperiod and 6-methoxybenzoxazolinone on the reproductive axis of inbred LSH/Ss Lak male hamsters. Journal of Reproduction and Fertility, 90:157-163, 1990). The above studies cumulatively point to 6-MBOA acting in an area of the brain, which may be referred to as the pineal hypothalamic pituitary axis (PHPA), possibly as a melatonin agonist and at the α- and β-adrenergic receptors in its own right. 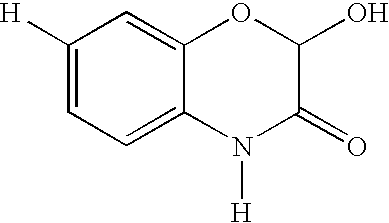 The inventors recognized that 6-MBOA and the indoleamine, melatonin, share a structural similarity. However, melatonin exacerbates symptoms of dysphoria in depressed people. 6-MBOA, as a melatonin agonist, could prove contrary in this regard and actually improve mood. Yet, the inventors are not aware of any prior art that has explored or suggested the use of 6-MBOA and related compounds as having psychotropic effects in humans, particularly with respect to depression or mood. It is a still further object of the present invention to provide novel chemical compositions derived, isolated, and/or extracted from monocotyledonous plants or by chemical synthesis, and methods of use as adjunctive therapy in arthritis. It is also an object of the present invention to provide novel methods for growing and harvesting monocotyledonous plants to obtain phenolic compounds with a phenolic molecule to which are covalently linked an oxygen-containing group, a nitrogen or second oxygen containing group, and at least one C 1-C4 alkoxy group. 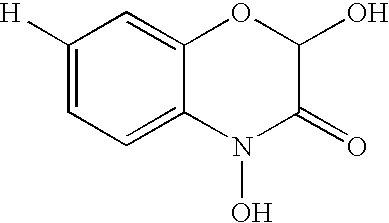 Additionally, it is an object of the present invention to provide novel methods for promoting weight loss in mammals by administering phenolic compounds with a phenolic molecule to which are covalently linked an oxygen-containing group, a nitrogen or second oxygen containing group, and at least one C 1-C4 alkoxy group. It is a further object of the present invention to provide novel methods for suppressing appetite in mammals by administering phenolic compounds with a phenolic molecule to which are covalently linked an oxygen-containing group, a nitrogen- or second oxygen containing group, and at least one C 1-C4 alkoxy group. A source of the novel compounds of the present invention is in monocotyledonous plants in their early growth stages. To obtain these compounds at concentrations suitable for human therapeutic use from such monocotyledonous plants, harvest of these plants at an early life history stage and drying using explicit parameters, as well as specific analytical criteria to ascertain suitability, are employed. However, it is also possible to get the compounds of the invention at concentrations suitable for human therapeutic use from animals parts, including, but not necessarily limited to, the velvet antler tips of deer and elk (Cervidae), where they become concentrated after ingestion by the animal of sprouting and otherwise immature grasses. The compounds of the invention can also be obtained through chemical synthesis. Referring to Formulae I-IV, below, the compounds of the invention have in common a phenol molecule to which are covalently linked an oxygen-containing group, a nitrogen- or another oxygen-containing group, and a C 1-C4 alkoxy group. Using standard conventions for depicting chemical structures, Formulas I-III disclose the chemical structures and specific parameters defining the compounds of the invention. Formula IV is a unifying formula depicting all compositions of the invention. Female montane voles,  Microtis montanus, received intra peritoneal injections of representative compounds belonging to Formulas I, II and III for three consecutive days and sacrificed twenty-four (24) hours after the last injection to examine uterine weight response. To assess the properties of each representative compound, pure ones made by chemical means (University of Utah Department of Chemistry, Salt Lake City, Utah) were prepared specifically for this test. All compounds were injected at a dose level of 5 mcg/day, dissolved in five percent (5%) propylene glycol for a total injection volume of 0.5 ml. Control animals received 0.5 ml of five percent (5%) propylene glycol only. All voles were 4-5 weeks old and weighed 25-29 g.
compounds of invention to adult males. compounds of the invention for six weeks. As an example, corn,  Zea mays, is typically grown to its adult or matured states for its seed-laden cob. At the immature growth stage at which compounds of the invention occur, corn plants have a biomass that portends harvest of a substantial amount of leaf material containing the compounds of the invention at concentrations suitable for human therapies. Hence, dried corn leaves from immature plants become appropriate for the human therapies elucidated herein, or the dried leaves are a resource for the concentration, extraction and purification of the compounds of the invention. There are other monocotyledonous plants with the natural production of compounds of the invention at concentrations suitable for human therapies. Monocotyledonous flowering plants belong to the plant order of Lilidae (sometimes referred to as a subclass or superorder), which may comprise the following plant families: Alismataceae (water-plantains), Araceae (lords-and-ladies), Butomaceae, Cyperaceae (cotton-grasses, spike-rushes and sedges; sometimes referred to as a plant order), Dioscoreaceae (black bryony), Hydrocharitaceae (waterweeds), Iridaceae (irises), Juncaceae (rushes and wood-rushes), Juncaginaceae, Lemnaceae (duckweeds), Liliaceae (lilies, onions and bluebells), Orchidaceae (orchids), Poaceae (grasses—also named Graminae), Potamogetonaceae (pondweeds), Sparganiaceae (bur-reeds), Typhaceae (bulrushes), and Zosteraceae. It is contemplated that compounds of the invention may be derived, isolated, harvested and/or extracted from monocotyledonous plants selected from any of the above identified plant families and/or orders. Preferred embodiments of compounds of the invention may be selected from the families of Cyperaceae and Poaceae (also referred to as Graminae). These families include the cereal grasses (e.g., corn, wheat, barley, oats, rice and rye) and the hay and pasture plants (e.g., sorghum, sugarcane, timothy, bent grass, bluegrass, orchard grass, and fescue). These families may also include wild grasses, millet, bamboo, Job's Tears ( Coix lachryma-jobi; Coix aquatica) and other barley-like grasses. Monocotyledonous plants as sources of compounds from preferred embodiments of the invention may be selected from the group consisting of corn, wheat, barley, rye, oats, rice, sorghum, millet, bamboo, Job's Tears, barley-like grasses, and wild grasses, by growing the plant to an immature life history stage (i.e., before plant maturity) and harvesting the plant. The example of corn,  Zea mays, is not intended to be limiting to the scope of the source of compounds of the invention. In all cases, harvest and processing needs to be done in a novel and unique fashion relative to the usual manner in which the plants are handled, and the analytical parameters for indirectly determining crop quality with respect to the compounds of the invention, described below, are applicable. Air-dried and freeze-dried velvet antler samples were obtained. These came from commercially farmed Canadian Wapiti and New Zealand red deer, both subspecies of elk,  Cervus elaphus. All animals had been maintained on grassy pasturage. The samples were from velvet antlers that had been growing fifty-five (55) to sixty-five (65) days, and included both tips, defined as the region five (5) cm or less in length starting at the apex, as well as other, more matured parts of the antler. 6-MBOA in Dried Velvet Antler from Elk, Cervus elaphus. The twenty (20) participants were randomly assigned to Test and Control Groups, with ten (10) participants in each group. In particular, those participants in the “Test Group” were given the novel compounds of the present invention which were produced and delivered in gelatin capsules (e.g., Size 00). The novel compounds of the invention were obtained from appropriately chosen, grown, dried and ground leaves from the corn plant ( Zea mays), further to the methods of harvesting as described hereinabove. In one presently preferred embodiment, the dosage was standardized to 6-MBOA content, for which daily cumulative dose was ninety (90) micrograms for each participant. Although it will be appreciated that compounds having the general chemical structure as set forth in formulae I, II, III, and generally as IV, 6-MBOA was used in the present exemplary study. It will be appreciated, therefore, that other novel compounds of the present invention, consistent with the general chemical structure as set forth in formulae I, II, III, and IV are within the spirit and scope of the present invention. Those participants in the “Control Group” were given ground, dried parsley leaves ( Petroselinum hortense) delivered in gelatin capsules (e.g., Size 00). This placebo preparation comprising parsley visually resembled capsules containing the compounds of the invention, but was instead made from a plant well recognized as having no effects on weight loss or other aspects of weight control; on mood, depression or feelings of well being; and/or on sexual function, arousal, or performance. compounds of the invention or a control. As shown, such embodiments of novel compounds of the present invention may include benzoxazinoids-cyclic hydroxyamic acids, lactams, and corresponding glucosides. As contemplated herein, substitution at the “R 1” position may be accomplished with a member selected from the group consisting of H and OCH3. Substitution at the “R2” position may be accomplished with a member selected from the group consisting of H and glucose (as a glucoside). Substitution at the “R3” position may be accomplished with a member selected from the group consisting of H, OH, and OCH3. Whereas this invention is here illustrated and described with reference to embodiments thereof presently contemplated as the best mode of carrying out such invention in actual practice, it is to be understood that various changes may be made in adapting the invention to different embodiments without departing from the broader inventive concepts disclosed herein and comprehended by the claims that follow. All changes which come within the meaning and range of equivalency of the claims are to be embraced within their scope. or pharmaceutically acceptable salts thereof. 3. A process as defined in claim 1, wherein said administered chemical composition comprises a daily dosage of between about 5 mcg and about 60 mg.
4. A process as defined in claim 1, wherein the administered chemical composition comprises a daily dosage of 15 mg.
5. A process as defined in claim 1, wherein at least one of said chemical compositions is obtained from one or more monocotyledonous plants selected from the group consisting of corn, wheat, barley, rye, oats, rice, sorghum, millet, bamboo, Job's Tears, barley-like grasses, and wild grasses, by growing the plant to an immature life history stage and harvesting the plant. 6. A process as defined in claim 5, wherein said harvested plant is dried. 7. A process as defined in claim 6, wherein said harvested plant is dried at a temperature in the range of between about 40° C. and about 45° C.
8. A process as defined in claim 6, wherein said dried harvested plant contains phenols in total amounts greater than 17.0 mg/gm (dry weight). 9. A process as defined in claim 6, wherein said dried harvested plant contains combined amounts of 4-hydroxycinnamic acid and 4-hydroxy-3-methoxycinnamic acid totaling no more than 1.5 mg/gm (dry weight). 10. A process as defined in claim 5, wherein said harvested plant is immature corn, Zea mays. 11. A process as defined in claim 10, wherein said immature corn has been grown to a height between about 45 centimeters and about 122 centimeters. 12. A process as defined in claim 10, wherein said immature corn has been grown to a height that does not exceed between about 30 centimeters and about 45 centimeters. 13. A process as defined in claim 10, wherein said immature corn has been grown for less than ten weeks after planting. 14. A process as defined in claim 1, wherein said chemical composition is administered in a manner selected from the group consisting of: (1) orally, in the form of tablets, capsules, suspensions, solutions and other means suitable for ingestion, including sublingual dosage forms; (2) intranasal administration; (3) transmucosal administration; (4) parenteral injection, in the form of subcutaneous, intramuscular, intravenous; (5) implant for sustained release; and (6) transdermal patch. 15. A process as defined in claim 1, wherein therapeutically effective amounts of said chemical composition further comprise adjunctive therapy for a condition selected from the group consisting of arthritis, sleep apnea, fibromyalgia, diabetes, and hyperglycemia. 19. A process as defined in claim 18, wherein said administered chemical composition comprises a daily dosage of between about 5 mcg and about 60 mg.
20. A process as defined in claim 17, wherein the administered chemical composition comprises a daily dosage of 15 mg.
21. A process as defined in claim 16, wherein at least one of said chemical compositions is obtained from one or more monocotyledonous plants selected from the group consisting of corn, wheat, barley, rye, oats, rice, sorghum, millet, bamboo, Job's Tears, barley-like grasses, and wild grasses, by growing the plant to an immature life history stage and harvesting the plant. 22. A process as defined in claim 21, wherein said harvested plant is dried. 23. A process as defined in claim 22, wherein said harvested plant is dried at a temperature in the range of between about 40° C. and about 45° C.
24. A process as defined in claim 22, wherein said dried harvested plant contains phenols in total amounts greater than 17.0 mg/gm (dry weight). 25. A process as defined in claim 22, wherein said dried harvested plant contains combined amounts of 4-hydroxycinnamic acid and 4-hydroxy-3-methoxycinnamic acid totaling no more than 1.5 mg/gm (dry weight). 26. A process as defined in claim 21, wherein said harvested plant is immature corn, Zea mays. 27. A process as defined in claim 26, wherein said immature corn has been grown to a height between about 45 centimeters and about 122 centimeters. 28. A process as defined in claim 26, wherein said immature corn has been grown to a height that does not exceed between about 30 centimeters and about 45 centimeters. 29. A process as defined in claim 26, wherein said immature corn has been grown for less than ten weeks after planting. 30. A process as defined in claim 16, wherein said chemical composition is administered in a manner selected from the group consisting of: (1) orally, in the form of tablets, capsules, suspensions, solutions and other means suitable for ingestion, including sublingual dosage forms; (2) intranasal administration; (3) transmucosal administration; (4) parenteral injection, in the form of subcutaneous, intramuscular, intravenous; (5) implant for sustained release; and (6) transdermal patch. 31. A process as defined in claim 16, wherein therapeutically effective amounts of said chemical composition further comprise adjunctive therapy for a condition selected from the group consisting of arthritis, sleep apnea, fibromyalgia, diabetes, and hyperglycemia. 34. A process as defined in claim 32, wherein said administered chemical composition comprises a daily dosage of between about 5 mcg and about 60 mg.
35. A process as defined in claim 32, wherein the administered chemical composition comprises a daily dosage of 15 mg.
36. A process as defined in claim 32, wherein at least one of said chemical compositions is obtained from one or more monocotyledonous plants selected from the group consisting of corn, wheat, barley, rye, oats, rice, sorghum, millet, bamboo, Job's Tears, barley-like grasses, and wild grasses, by growing the plant to an immature life history stage and harvesting the plant. 37. A process as defined in claim 36, wherein said harvested plant is dried. 38. A process as defined in claim 37, wherein said harvested plant is dried at a temperature in the range of between about 40° C. and about 45° C.
39. A process as defined in claim 37, wherein said dried harvested plant contains phenols in total amounts greater than 17.0 mg/gm (dry weight). 40. A process as defined in claim 37, wherein said dried harvested plant contains combined amounts of 4-hydroxycinnamic acid and 4-hydroxy-3-methoxycinnamic acid totaling no more than 1.5 mg/gm (dry weight). 41. A process as defined in claim 36, wherein said harvested plant is immature corn, Zea mays. 42. A process as defined in claim 41, wherein said immature corn has been grown to a height between about 45 centimeters and about 122 centimeters. 43. A process as defined in claim 41, wherein said immature corn has been grown to a height that does not exceed between about 30 centimeters and about 45 centimeters. 44. A process as defined in claim 41, wherein said immature corn has been grown for less than ten weeks after planting. 45. A process as defined in claim 32, wherein said chemical composition is administered in a manner selected from the group consisting of: (1) orally, in the form of tablets, capsules, suspensions, solutions and other means suitable for ingestion, including sublingual dosage forms; (2) intranasal administration; (3) transmucosal administration; (4) parenteral injection, in the form of subcutaneous, intramuscular, intravenous; (5) implant for sustained release; and (6) transdermal patch. 46. A process as defined in claim 32, wherein therapeutically effective amounts of said chemical composition further comprise adjunctive therapy for a condition selected from the group consisting of arthritis, sleep apnea, fibromyalgia, diabetes, and hyperglycemia. 50. A process as defined in claim 47, wherein said administered chemical composition comprises a daily dosage of between about 5 mcg and about 60 mg.
51. A process as defined in claim 47, wherein the administered chemical composition comprises a daily dosage of 15 mg.
52. A process as defined in claim 47, wherein at least one of said chemical compositions is obtained from one or more monocotyledonous plants selected from the group consisting of corn, wheat, barley, rye, oats, rice, sorghum, millet, bamboo, Job's Tears, barley-like grasses, and wild grasses, by growing the plant to an immature life history stage and harvesting the plant. 53. A process as defined in claim 52, wherein said harvested plant is dried. 54. A process as defined in claim 53, wherein said harvested plant is dried at a temperature in the range of between about 40° C. and about 45° C.
55. A process as defined in claim 53, wherein said dried harvested plant contains phenols in total amounts greater than 17.0 mg/gm (dry weight). 56. A process as defined in claim 53, wherein said dried harvested plant contains combined amounts of 4-hydroxycinnamic acid and 4-hydroxy-3-methoxycinnamic acid totaling no more than 1.5 mg/gm (dry weight). 57. A process as defined in claim 52, wherein said harvested plant is immature corn, Zea mays. 58. A process as defined in claim 57, wherein said immature corn has been grown to a height between about 45 centimeters and about 122 centimeters. 59. A process as defined in claim 57, wherein said immature corn has been grown to a height that does not exceed between about 30 centimeters and about 45 centimeters. 60. A process as defined in claim 67, wherein said immature corn has been grown for less than ten weeks after planting. 61. A process as defined in claim 47, wherein said chemical composition is administered in a manner selected from the group consisting of: (1) orally, in the form of tablets, capsules, suspensions, solutions and other means suitable for ingestion, including sublingual dosage forms; (2) intranasal administration; (3) transmucosal administration; (4) parenteral injection, in the form of subcutaneous, intramuscular, intravenous; (5) implant for sustained release; and (6) transdermal patch. 62. A process as defined in claim 47, wherein therapeutically effective amounts of said chemical composition further comprise adjunctive therapy for a condition selected from the group consisting of arthritis, sleep apnea, fibromyalgia, diabetes, and hyperglycemia. 64. A process as defined in claim 63, wherein said administered chemical composition comprises a daily dosage of between about 5 mcg and about 60 mg.
65. A process as defined in claim 63, wherein the administered chemical composition comprises a daily dosage of 15 mg.
66. A process as defined in claim 63, wherein at least one of said chemical compositions is obtained from one or more monocotyledonous plants selected from the group consisting of corn, wheat, barley, rye, oats, rice, sorghum, millet, bamboo, Job's Tears, barley-like grasses, and wild grasses, by growing the plant to an immature life history stage and harvesting the plant. 67. A process as defined in claim 66, wherein said harvested plant is dried. 68. A process as defined in claim 67, wherein said harvested plant is dried at a temperature in the range of between about 40° C. and about 45° C.
69. A process as defined in claim 67, wherein said dried harvested plant contains phenols in total amounts greater than 17.0 mg/gm (dry weight). 70. A process as defined in claim 67, wherein said dried harvested plant contains combined amounts of 4-hydroxycinnamic acid and 4-hydroxy-3-methoxycinnamic acid totaling no more than 1.5 mg/gm (dry weight). 71. A process as defined in claim 66, wherein said harvested plant is immature corn, Zea mays. 72. A process as defined in claim 71, wherein said immature corn has been grown to a height between about 45 centimeters and about 122 centimeters. 73. A process as defined in claim 71, wherein said immature corn has been grown to a height that does not exceed between about 30 centimeters and about 45 centimeters. 74. A process as defined in claim 71, wherein said immature corn has been grown for less than ten weeks after planting. 75. A process as defined in claim 63, wherein said chemical composition is administered in a manner selected from the group consisting of: (1) orally, in the form of tablets, capsules, suspensions, solutions and other means suitable for ingestion, including sublingual dosage forms; (2) intranasal administration; (3) transmucosal administration; (4) parenteral injection, in the form of subcutaneous, intramuscular, intravenous; (5) implant for sustained release; and (6) transdermal patch. 76. A process as defined in claim 63, wherein therapeutically effective amounts of said chemical composition further comprise adjunctive therapy for a condition selected from the group consisting of arthritis, sleep apnea, fibromyalgia, diabetes, and hyperglycemia. 78. A process as defined in claim 77, wherein said administered chemical composition comprises a daily dosage of between about 5 mcg and about 60 mg.
79. A process as defined in claim 77, wherein the administered chemical composition comprises a daily dosage of 15 mg.
80. A process as defined in claim 77, wherein at least one of said chemical compositions is obtained from one or more monocotyledonous plants selected from the group consisting of corn, wheat, barley, rye, oats, rice, sorghum, millet, bamboo, Job's Tears, barley-like grasses, and wild grasses, by growing the plant to an immature life history stage and harvesting the plant. 81. A process as defined in claim 80, wherein said harvested plant is dried. 82. A process as defined in claim 81, wherein said harvested plant is dried at a temperature in the range of between about 40° C. and about 45° C.
83. A process as defined in claim 81, wherein said dried harvested plant contains phenols in total amounts greater than 17.0 mg/gm (dry weight). 84. A process as defined in claim 81, wherein said dried harvested plant contains combined amounts of 4-hydroxycinnamic acid and 4-hydroxy-3-methoxycinnamic acid totaling no more than 1.5 mg/gm (dry weight). 85. A process as defined in claim 80, wherein said harvested plant is immature corn, Zea mays. 86. A process as defined in claim 85, wherein said immature corn has been grown to a height between about 45 centimeters and about 122 centimeters. 87. A process as defined in claim 85, wherein said immature corn has been grown to a height that does not exceed between about 30 centimeters and about 45 centimeters. 88. A process as defined in claim 85, wherein said immature corn has been grown for less than ten weeks after planting. 89. A process as defined in claim 77, wherein said chemical composition is administered in a manner selected from the group consisting of: (1) orally, in the form of tablets, capsules, suspensions, solutions and other means suitable for ingestion, including sublingual dosage forms; (2) intranasal administration; (3) transmucosal administration; (4) parenteral injection, in the form of subcutaneous, intramuscular, intravenous; (5) implant for sustained release; and (6) transdermal patch. 90. A process as defined in claim 77, wherein therapeutically effective amounts of said chemical composition further comprise adjunctive therapy for a condition selected from the group consisting of arthritis, sleep apnea, fibromyalgia, diabetes, and hyperglycemia. 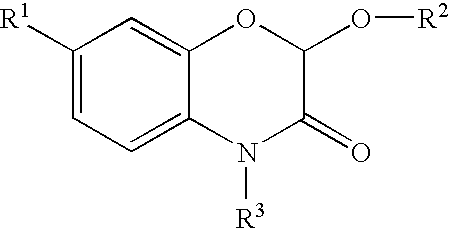 FR2663634B1 (en) 1990-06-22 1992-09-04 Adir News acyl benzoxazolinones, their process for the preparation and pharmaceutical compositions containing them. FR2663633B1 (en) 1990-06-22 1994-06-17 Adir News chalcones, their process for the preparation and pharmaceutical compositions containing them. 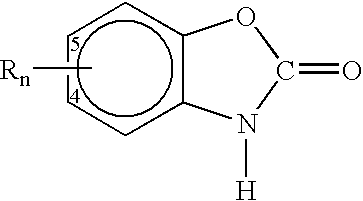 FR2667068B1 (en) 1990-09-26 1994-09-09 Adir New heterocyclic alkyl amines, their process for the preparation and pharmaceutical compositions containing them. 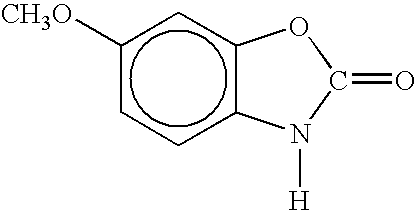 FR2717810B1 (en) 1994-03-22 1996-04-26 Adir News aminoalkyl benzoxazolinones and benzothiazolinones, their method of preparation and pharmaceutical compositions containing them. 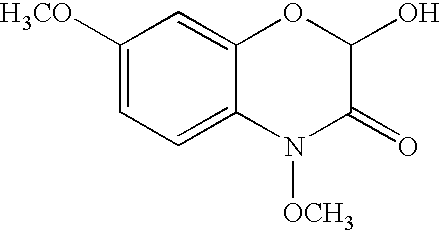 FI72715C (en) 1987-07-10 Foerfarande Foer framstaellning of nya, terapeutiskt anvaendbara 2-hydroxymethyl-3,4,5-trihydroxipiperidinderivat.